Aquarium Use Middleground, or as a floating plant. Water Chemistry Ideally soft and acidic (pH 5.8-6.8) where it will grow rapidly, but a wide range of conditions are tolerated. Substrate Enriched substrate beneficial when growing as a rooted plant. 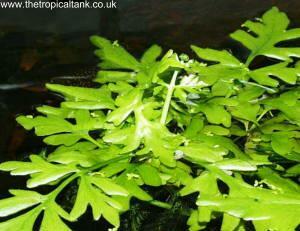 Comments A very versatile plant, it can be grown submersed or as a floating plant. Buds form on older leaves, which can be separated at about an inch across and replanted or left floating. The leaf colour and shape is variable under different lighting conditions.